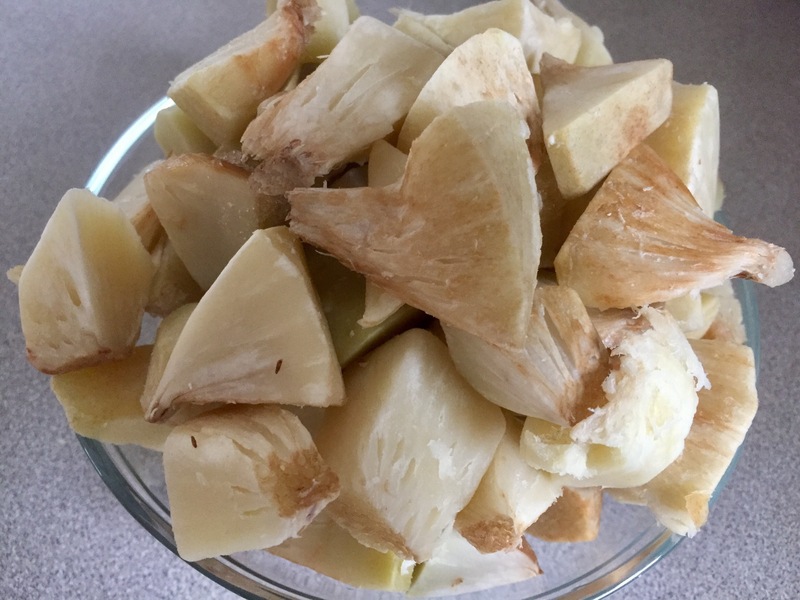 Breadfruit is not something that you can find in your local grocery store unless you live in one of the tropical countries where it’s been a staple food for millennia. Yet, it’s a fruit, or maybe I should say a vegetable, that has been taking the fancy of historians, writers, artists and the silver screen perhaps because of its poetic name, breadfruit, that suggest ability to pick your loaf of a branch! Or perhaps because it hails from exotic regions of our planet that one could reach only by taking an epic journey, like the one taken by the “Bounty“, a ship whose voyage and its mutiny is part of actual and the movie making history. To be quite honest all my knowledge of breadfruit comes from watching different versions of the mutiny on the Bounty movies so I got quite excited when I saw it in my local Indian supermarket. I was looking for some frozen jackfruit and the breadfruit was right next to it. So I grabbed a bag and decided to give breadfruit a try! 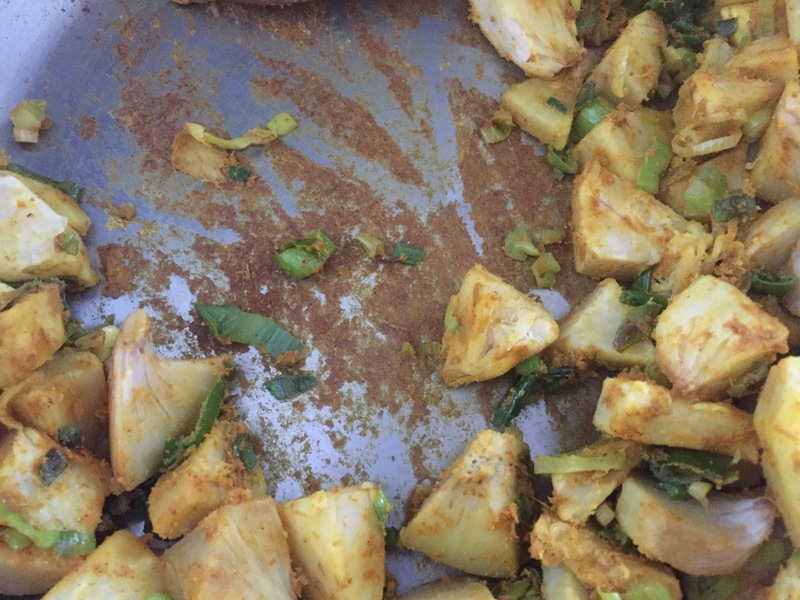 Texture-wise, breadfruit is not unlike jackfruit, and they do belong to the same plant family. But, breadfruit is a bit softer, at least in my hands, and less chewy. 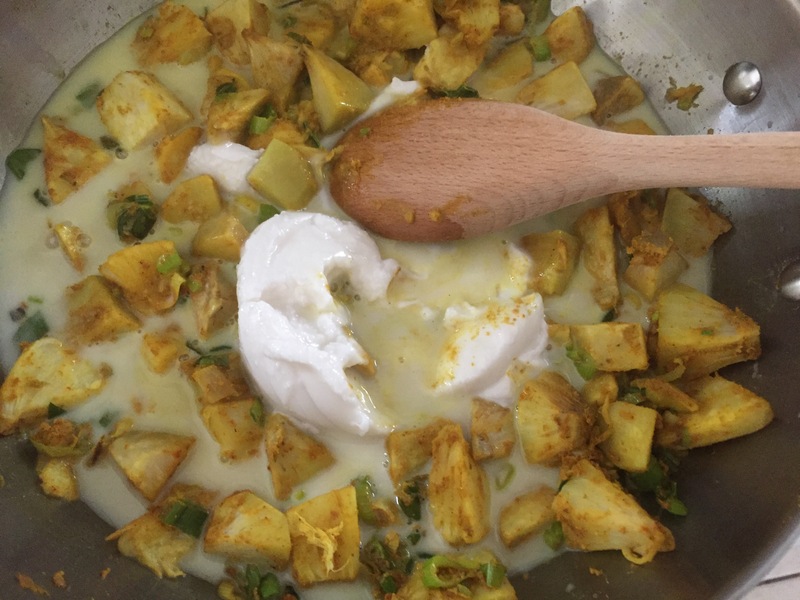 It worked really well in this simple curry, and pairs really well with simple Basmati Rice. 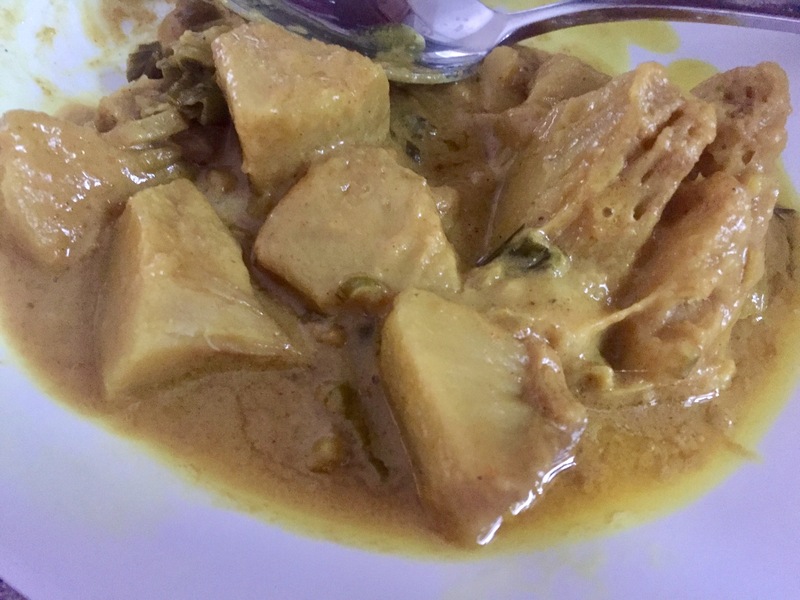 The recipe is really simple and starts with frozen breadfruit, scallions (green onions), curry powder, green curry and turmeric, and finishes with some rich coconut cream. The dish comes together into a fragrant curry that tastes almost decadent. Spray a large pan with cooking spray and place over medium high heat. 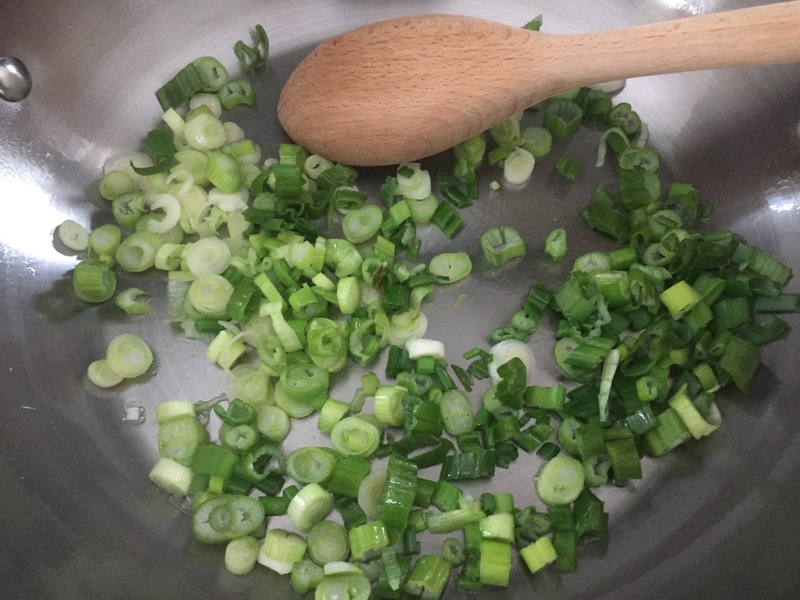 While the pan is heating up chop scallions, both white and green parts. Add to the pan and sauté for 3-5 minutes. 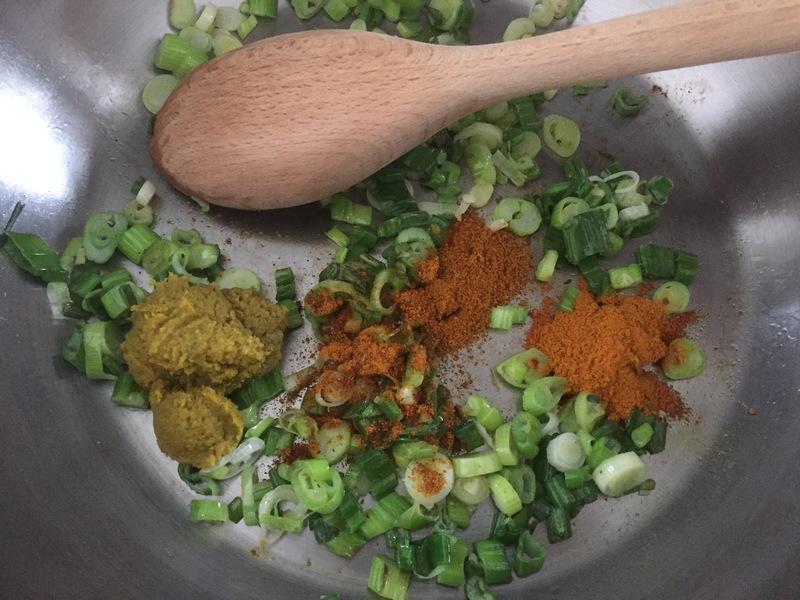 Add the green curry paste, turmeric and curry powder. Mix everything together and sauté for another minute or two. Add the breadfruit. You can add it frozen or defrost in a microwave. 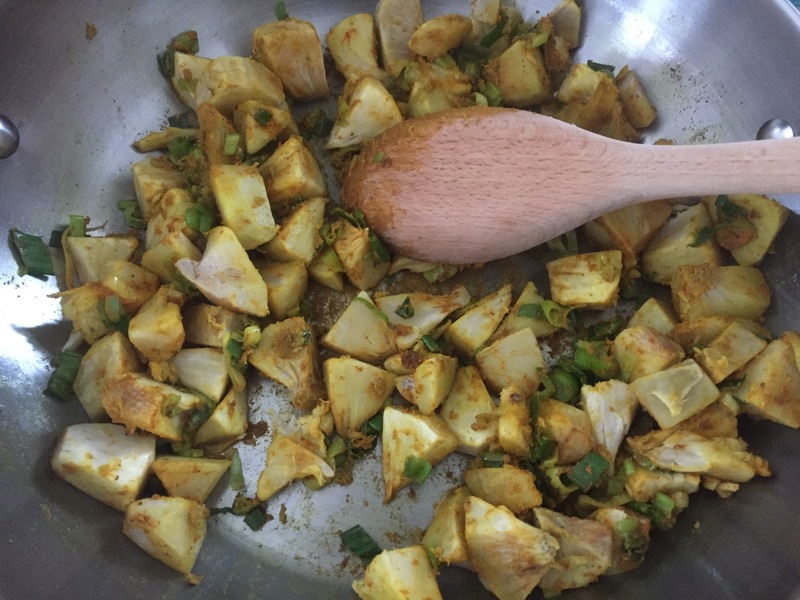 Mix well, and let sauté for 10 minutes or so until breadfruit is soft, covered in spices and starts to brown. Pour in the coconut milk and deglaze the bottom, which means use your wooden spoon and coconut milk to lift all the brown bits of caramelized scallions and spices of the bottom of the pan and incorporate them into the sauce. Decrease the heat to low and let simmer for 15 to 20 minutes. Serve over rice, couscous or even polenta!! !